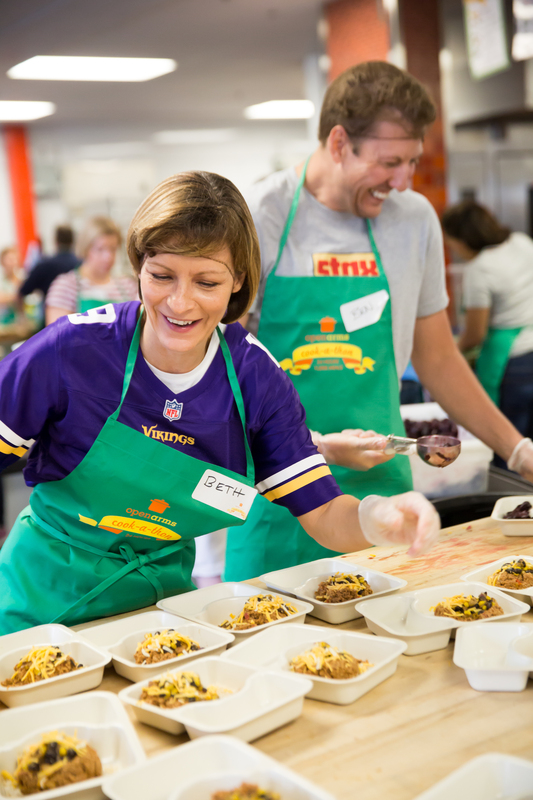 The Open Arms Cook-a-Thon is our annual 24-hour volunteer event on September 21-22, 2018 where teams of six people will fill two-hour shifts to prepare and package nutritious food for Open Arms of Minnesota’s clients living with life-threatening illnesses in the Twin Cities. 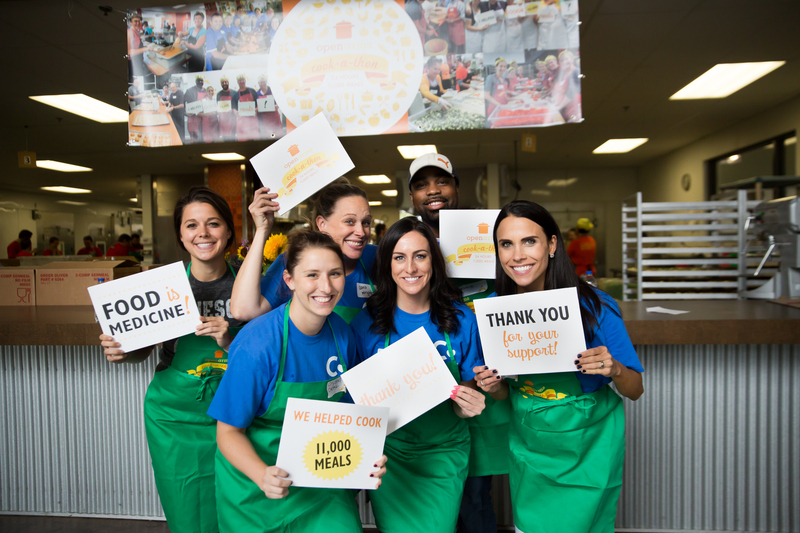 Our goal is to prepare a week's worth of meals (11,000 meals!) in just 24 hours! Every member of each team will be asked to raise at least $125 to support their work, resulting in at least $750 raised from each team to support nourishing meals for neighbors in need. 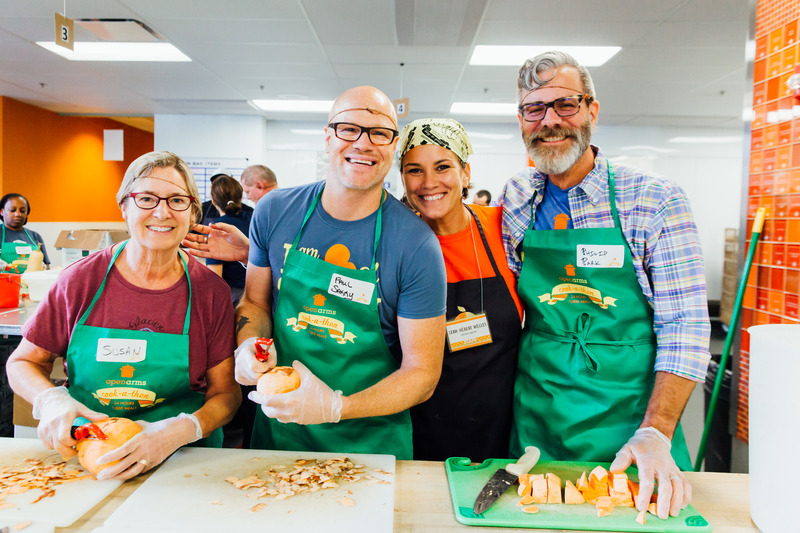 This event will put the Open Arms’ kitchen at least a week ahead of production before the end of the year and add significant capacity to our efforts to provide nutritious, delicious food to more than 1,100 people in our community each week! The 2018 Cook-a-Thon is made up of two-hour shifts at Open Arms running for 24 hours straight from noon on Friday, September 21 to noon on Saturday, September 22. You can expect treats, coffee, friendly competitions and the chance to make a huge difference for families in the Twin Cities living with life-threatening illnesses. - Raise $750 as a team: Your team is guaranteed a two-hour volunteer shift during the 24-hour event and every team member gets a new 2018 Cook-a-Thon apron. - Raise $1,500 as a team: Your team gets to pick a shift time from the available slots! * In addition, every team member gets a 2018 new Cook-a-Thon apron. *Shift slots are available on a first-come, first-served basis when your team crosses the $1,500 goal. Alternately, during registration team captains can opt to pledge that their team will raise or donate $1,500 and select their shift time right away; any remaining balance by September 22 will be charged to the team. If you select this option, we'll email you with the shift time selection process. - Raise $2,000 as a team: Your team will receive six limited-edition Cook-a-Thon t-shirts, the chance to pick your shift time from the available slots, and every team member gets a new 2018 Cook-a-Thon apron. - NEW! 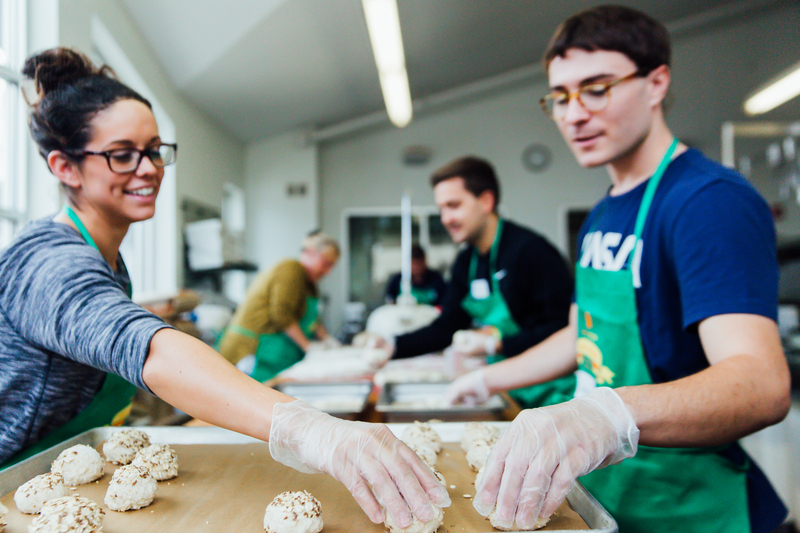 Raise $3,000 as a team: Your team will receive six limited-edition Open Arms winter swag items, six 2018 Cook-a-Thon t-shirts, the chance to pick your shift time from the available slots, and every team member gets a 2018 Cook-a-Thon apron. The top three teams to raise the most money for our clients will receive special prizes (and bragging rights!). Please note that for teams with more than six members, only the top six fundraisers will have their totals count toward team competitions. - 3rd place team: A private pizza-making class with talented Open Arms baker Margaret Chamberlain. The top individual fundraiser also has a special prize in store: their very own permanent tile on the walls of Open Arms, proclaiming their champion status! The fundraising deadline for the Race to the Finish is noon sharp on Saturday, September 22, at which point we'll declare winners of the competitions.